This adapter allows you to split your turn signals so you can operate external turn signals, as well as the integrated tail light signals. Or you can operate hand guard integrated signals, as well as typical front turn signals. 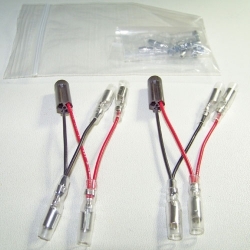 The adapter you receive may differ from image shown based on options selected, part shown in picture is "WR250X/R-BUL-BUL"
B = a universal bullet outputs for aftermarket accessories. O = an oem factory output plug to connector to factory turn signal. R = device will only work on REAR of motorcycle. F = device will only work on FRONT of motorcycle. Example: KLX250S/SM-B-O-R will plug into a KLX250S/SM, have 1 universal bullet output, 1 oem factory output, and only works for REAR of motorcycle. UNIVERSAL-POSI-R uses posi-taps and will allow adding any of our LED turn signals to a rear integrated tail light setup. Allows you to split your turn signals to two outputs. 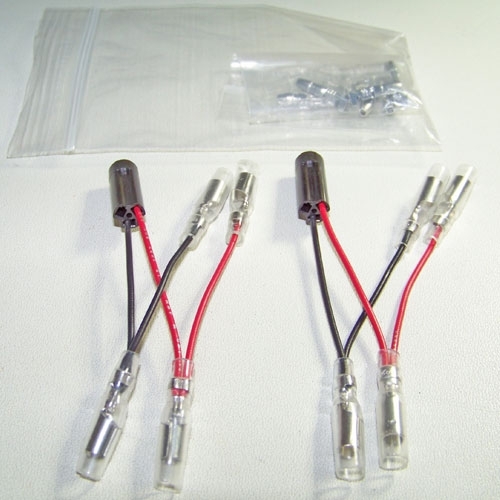 Set Includes: one turn signal splitter adapter set which splits left and right.